Dennis Stuckey, President of the Board of Directors for the County Commissioners Association of Pennsylvania (right), presents the Excellence in Website Design Award to Chester County Communications Coordinator Becky Brain (left), and Sue Morris, the County’s Digital Communications Coordinator. WEST CHESTER — Chester County’s website, www.chesco.org, received top state-wide honors with the County Commissioners Association of Pennsylvania (CCAP) naming it a winner in its 2018 Excellence in Website Awards. 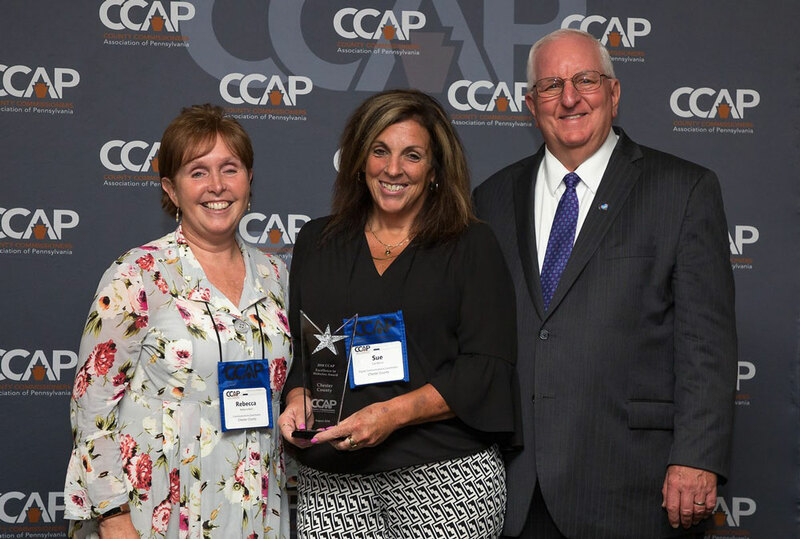 The award, for website in a first-to-third class county, was recently presented to Chester County at the CCAP annual conference in Gettysburg, PA.